A battery inverter is a similar device to your solar inverter. Batteries store DC power, not AC. So once again, we need an inverter to switch the DC power from the battery into AC power for the home. Unlike solar inverters, battery inverters also need to be able to take AC power from the home, turn it into DC and store it in the battery. This AC power from the home would likely be excess solar production, but it could also be grid power. The battery is the unit that stores the energy. Most of the popular batteries are some form of lithium ion, with Nickel Manganese Cobalt (NMC) being used in the Tesla Powerwall 2 and the LG Chem. NMC takes up little space, is light and can be discharged quickly, which is why they're the choice of many electric vehicle manufacturers. Lithium Iron Phosphate (LiFePO4) is another popular type of lithium ion. It's not as light or compact as NMC, but is preferred by some due to it's longevity. Other types of batteries do exist, but are struggling to compete on cost. Both Redflow and Aquion, manufacturers of zinc-bromide flow and salt water batteries respectively, have struggled to compete with the lithium giants, despite having high quality products. Batteries are also being classed by the voltage they operate at. Newer residential batteries, like the Tesla Powerwall 2 and two of the products in the LG Chem range are considered high voltage at around 400V, while others are lower voltage at around 48V. There seems to be a swing to high voltage batteries, as this voltage requires less work for the new hybrid and battery inverters. Popular hybrid and battery inverters, like the Fronius Symo Hybrid, SolarEdge StorEdge and the SMA Sunny Storage, are all designed to work with high voltage batteries. When you added a solar inverter, it didn't need to know how much power to produce - it just produced as much as it could. This is not the same for a battery inverter. A battery inverter needs to know if power is being returned to the grid from excess solar or if the house is drawing from the grid. This tells it when to charge and discharge the battery. Some metering devices will also measure the production of the existing solar power system. Here we see two AC coupled systems, the Tesla Powerwall 2 and a SMA Sunny Storage with LG Chem. You wouldn't install both, but this shows how each is installed with an existing string inverter system. Why can't I just connect panels to my current inverter? Unfortunately, you can't just connect batteries to your current solar inverter without any additional components. The solar inverter is not designed to have power from the grid going into the battery or to run during the night. However, there are new devices coming into the market called hybrid inverters. These are designed to have both batteries and solar panels connected to it. If you're looking into a new system with panels and a battery, a hyrbid inverter may be a good solution for you. Hybrid inverters are discussed in more detail in our hybrid inverter blog post. The biggest pro for the AC coupled solution is that it is far easier and cheaper to retrofit to an existing solar system. Easier because you don't need to worry about your existing setup and cheaper because you're not replacing any components. Another benefit is that you're increasing your overall inverter capacity, as you're adding an inverter. So if you had a 5 kW solar inverter and a 5 kW battery inverter, your total output would be 10 kW, which is higher than using a 5 kW hybrid inverter. Increasing overall capacity does have a drawback, which we'll discuss later. AC coupled solutions have been around for a lot longer than hybrid solutions, so you could also say it's a more tested solution. Despite it's simplicity, there are quite a few drawbacks. Storing solar power into the battery, something you'll want to do a lot of, requires two conversions a hybrid system doesn't. To store your solar, the solar inverter must convert it into AC first and then the battery inverter will convert it back into DC to store it again. Even with good inverters, you're going to lose about 3% each time there. Increasing your inverter capacity, while having it's benefits, could also create headaches getting approvals by some networks operators. A network operator, like Ausgrid, Energex, Ausnet, SA Power Networks, etc. must specify that they will allow more than 5 kW of total capacity per phase. Some networks will be fine with it, others won't be, so it could cause issues. Backup power can also be harder with AC coupled, as communication needs to be established between the inverters. This can be simple or impossible, depending on the inverters you're using. AC coupled solutions also don't allow you to benefit from oversizing your solar. A hybrid inverter, like the Fronius Symo Hybrid or the SolarEdge solution, will store excess solar production that it cannot convert. For example, if you had a 5 kW hybrid inverter and your oversized panel array was producing 6 kW, the hybrid inverter could charge the battery with 1 kW while outputting 5 kW. With AC coupled, you can't do this. The extra 1 kW would be clipped by the solar inverter and wasted. The Clean Energy Council (CEC) will even let you put more solar on than the 133% rule if you install a hybrid inverter and a battery, because you're not wasting excess solar. In our opinion, if you're retrofitting a battery to a good solar system, go with an AC coupled solution. Below are three popular AC coupled solutions, including the Tesla Powerwall 2. If you need to upgrade or your installing your first solar system and you want batteries, go hybrid. That being said, there's an absence of good quality hybrid inverters on the market today from our favourite inverter brands. There's no SMA hybrid and Fronius only have a three phase option (the Symo Hybrid). There is however the StorEdge solution from SolarEdge, which we believe is an excellent single phase hybrid solution. The Tesla Powerwall 2 is a battery and an inverter built in. The battery stores 13.5 kWh and can output 5kW, which is excellent for its size and price. It shows that Tesla have achieved high economies of scale with their NMC batteries. The Powerwall 2 also offers the ability to do backup power, but you'll pay more for that functionality and it won't work with all existing solar inverters. This is one of the most popular AC coupled solutions on the market. You can expect to pay between $10,000 and $12,000 for this unit installed. Enphase has bought out a neat little solution called the AC Battery. It is essentially a small battery pack with one of their excellent micro inverters built in. They have opted for a smaller size, both physically and in terms of energy and power. At just under 1.2 kWh of storage and only 270W peak output, you'll need at least a few of these for a decent amount of storage. Enphase have opted for what they believe is the safer and longer lasting LiFePO4 chemistry, and have backed it up by allowing home owners to cycle the battery twice per day. Backup power is not possible with these batteries. Each unit will set you back around $1,500 to 2,000, but you'll need an Enphase Envoy-S Metered installed at the site which is worth around $500. Adding more Enphase AC Batteries as you need them is also very easy once you're up and running. This solution combines the Sunny Storage 2.5 battery inverter from SMA and the LG Chem RESU high voltage range, two products from experienced manufacturers. The LG Chem RESU10 is an NMC battery that offers just over 9 kWh of usable storage, while the battery inverter has the ability to charge and discharge at 2.5 kW. 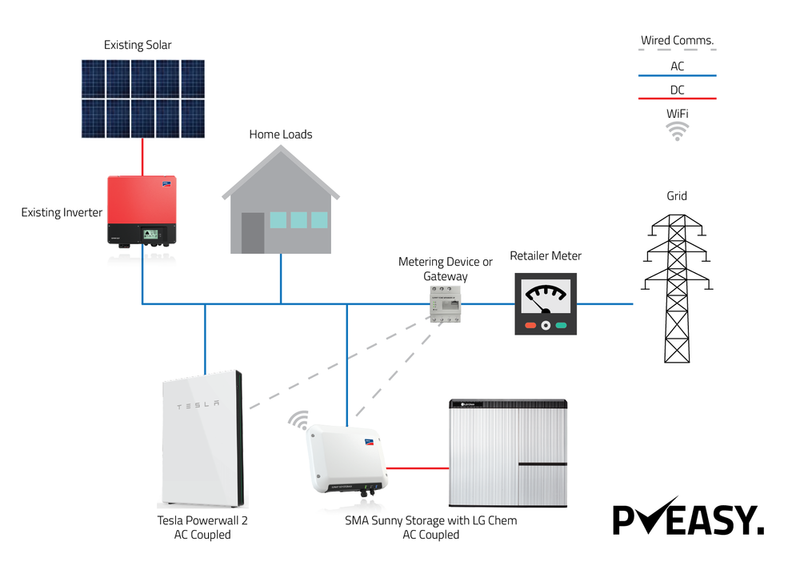 This solution can be configured for backup power, however additional components will be required and it won't work with all solar inverters. This solution will cost between $10,000 and $12,000 installed. Older PostIs consumption monitoring worth it?